First things first – I have an amazing new blog design and I am thrilled with it! Samantha (of the blogs Temporarily Me and Craftastrophe) from Temptation Designs put this together for me. Samantha, thank you for EVERYTHING you have done for me and my family the last two months. Everyone else? Sam is available to do blog design for you! Go check her out, she is the BEST! I love my husband dearly, but Mike is all boy. He is a messy eater, picks at scabs, and thinks burps and farts are hysterical. I was so relieved when I found out we were having a little girl. I imagined her being a feminine dainty thing who shunned all the gross boy-things her daddy did. But, no. She was just like her daddy, laughing at bodily functions. I have to admit…she made burping cute. She really is gorgeous. And so obviously happy and loved. Loving the new design. Awesome work, Samantha! There’s the Maddie Moo we all know and love! Boys! And it’s crystal clear how much Maddie loves her daddy. And I love the new blog layout. It’s just stunning. Burping is terribly cute when Maddie does it! Any update on your blood condition that your doctor diagnosed? The theme looks great Heather. I tend to resist change, but this is easy to get used to. I love that Mike is able to just hold Maddie in front of the camera like that. If I tried that with Tyler, he would freak the eff out and start squirming to get away. lol How cute! And it stunk. Heh! The Spohrs ARE INDEED multiplying …. you have the biggest family now, all over the world. Great video! I love how she reached for either you or the camera… so cute! Love the new look of the blog too… very stylish! hugs and love from NJ. i just cant help completely falling in love with Maddie over and over each time i see a photo or video on your blogs. she’s perfect. you’ve been so lucky as was she. cuteness is…madeline! thanks for sharing such a simple, happy moment. your love for each other always jumps off the screen! The funny is back! I’m so happy for your progress, H.
And Sam is yet more proof that we Americans need to better appreciate our Canadian neighbors. Adorable! Funny with the “wow” thing as that is one thing our daughter tries to repeat back to us too! omg that is adorable! rofl! Great job, Sam! The site looks fantastic! I’m a new friend loving y’all (from Texas) but living in Australia. Your Maddie is such a cutie-pie, yes, even when burping!! What another precious memory, I’m sure it bring a smile to your face every time you watch it. 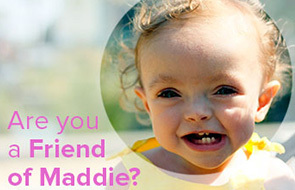 Maddie is just so adorable and even her burping brings smiles to the faces of family, friends and stranger friends all over the world. Thinking of you today, as always. she does make burping look adorable! I’d like to think my burps are that cute, but sadly, I know they’re not. It’s so funny when little girls – our delicate little flowers – can let ’em rip better than their own dads. I used to think the same thing – I’m glad we’re having a girl because hopefully she won’t think all those “boy things” are so funny, but I was wrong – our little girl and her Daddy get obscene amounts of enjoyment from rude bodily functions! Now we’re having a boy… whatever am I going to do? Thanks for sharing these great memories. Am also impressed by a burp with hang time. Man, I love that baby! Yes, her burping is very cute. It’s SO sweet to see you or Mike holding her. So cute! And i love the blog design! She makes everything cute. Such a sweetie! Ditto what they all said! Love the new layout! Great job Sam. Maddie, oh so cute, even when burping! I love your new blog design! Your last post was missing the last paragraph when I read it. It ended with “I stood there by t” I thought you were trying to make us guess how the sentence ended kinda being poetic or something. Do you know how many different sentences I came up with trying to figure out what you meant because I thought it was done on purpose, lol. I just read the last paragraph and saw the last picture, great post! Oh and bodily functions, I hear ya! sweet things make even gross things sweet! case in point => maddie! too funny. i love the way her little fists punch out toward you. When I woke up this morning, the sun shining, the birds were singing, and my house was still and quiet. As I dragged myself out of bed, I wondered if you were going to share another video of Maddie with us all today”. Sending you a warm hug and hoping sooner than later, you will get your laughter back. SO cute! I love how she turned around to look at Mike! Stinky burps. Everyone falls prey to them. Gorgeous. I love the fact that you share your videos of Maddie with us. I have to admit, I laugh at farts too, we often giggle at them, especially my daughter (28) and I.
farts are funny… so are maddie fist-pumps. Very sweet indeed. Hope you and Mike have a nice weekend. Tee hee…she would fit in well at my house. I love that you’re able to start laughing at things a bit now. I know you’re not me, but there was a period of time where I felt so guilty at laughing and smiling at memories, after my dad’s death. I felt like it was wrong to even express a positive emotion. Glad to see you can make a little joke once in a while. I learned that being happy once in awhile doesn’t betray or negate your loss. The loss of someone you love so so much is complicated and so multi layered, isn’t it??? ?So many emotions under one experience. Aww!! She is so happy. And You can tell she loves her mommy and daddy so much. Those eyes and that smile just melts your heart. I love the new look of your design. My thoughts are with you. Wait…burps and farts are hysterical! I can’t be the only woman to think so, right? Well, Maddie and I will have that in common, then. Very cute!! I like the new design but it is missing the link to Mike’s blog. Anything is cute when it comes out of such a cute baby! Maddie is my hero. So are you and Mike. Even if Mike burps. What a doll! Ya know, all babes are cute. But, some babes are cuter. This daughter of yours puts a smile on my face, every single time. And, I could use more smiles. We all could. So, thank you for the smiles, Maddie. And, thank you Heather and Mike, for sharing them. The new layout is great. And yes, she made burping cute. So cute! The new look is beautiful! I can’t believe that there are video’s of Maddie that I have not seen… This was one that was totally new. Back to Flickr again.. for my Maddie fix! Classic that she pointed it at Mike. Dang, the Moozer was a funny kid! So cute. Praying for you. Love the design! It looks great!!! Dang, that’s cute. I’ll tell ya, one of the most hysterical thing my daughter does is laugh so hard she burps. And then she laughs harder because of the burping. Which leads to more burping. It’s really gross, but funny. That was pretty darn funny & cute!!! Just want you to know that an NICU staff in Central Texas has been following your blog and knowing and feeling what you and Mike have been going through. I work in the NICU, which we just moved into a new Fantastic unit; I would love to share some of our photos with you. We all have read your blogs daily, seen Maddie’s face when we close our eyes. So glad to hear you are jumping into supporting the March of Dimes. We feel your pain, we laugh when you laugh, and know that you will keep Maddie in everything you do. Your suggestions on things for NICU parents is a great idea. We may start that in our unit. As a unit and team, the moment we get a premie in the unit, we all quietly say a prayer, and take each moment as a precious one. We go through alot and see alot, and we love to see those that get to leave and go home with the parents. When I lost my mother, 4years ago to colon cancer, I felt the world fall in on me, she was my confidant, best friend, and I saw her suffer, but as I ask God everyday to help me get out of bed and face another day, he encouraged me to keep her spirit alive, talk about her, laugh about her, and at times when I felt my lowest, I would come across someone who had experienced something more profound and worse than me. I still tear up when talking about her, but I can smile and remember all the great fun times we had together. Our NICU team is praying for you and Mike, and you keep sending out photos of Maddie, talking about the fun times with her. Her curls knock me over every time. So cute. I love the new look and Maddie was so funny. On a side note, I can’t get your RSS feed to work for me. I get an error when I try to subscribe. Awww… I love the videos of her…. I just love the purple theme, it is so awesome! Maddie is so adorable. Pretty soon, if not already, you and Mike will start having dreams of her. That is her visiting you. I dream of my mom and dad often, and I miss them too. Awww. VERY cute, sweet, and funny! Hello! I was out and about today jammin’ to a little ol’ skool Puff Daddy when a song come on. I thought of you and Maddie. The song was “Missing You” that Puffy did when Biggy Smalls was shot. Anyway, I thought of you guys today when grief and hip hop crossed my airways. Although I have never met you and and your family y’all are in my thoughts! Music for me is therapy…I have read your blog, and today while reading this song came on…This song to me….is how I imagine you must feel….please hold your head up high…..be strong..for there are so many people who love you and need you.. im sure…. Beautiful. She was such an Angel! And that video is adorable! i love the new blog design and the video too, of course! …thinking of you guys always. Thinking of your family today. Remember times like these with Maddie to help you get through the day. I love the new blog design too. Thinking of you all. Please give an update on Mike – he is in our prayers too of course. I’ve never – except for my own – seen such a lovable child. I just wanted to share that I have been reading your blog for several months now and I often share it with my 2 year old daughter. She LOVES the videos of Maddie and often repeats “Wow” while she smiles brightly at Maddie on the computer screen! She will say, “Again” each time the video ends and this can go on for qite sometime! Thank you Heather for sharing your little girl with me and my little girl! She truly is special and will always be remembered!!! I love it, Heather! So funny. By clicking on a few links, this video took me to many other videos of Maddie that I hadn’t seen, as well as an incredible tribute video to the lyrics of “Streets of Heaven” that left me flat-out sobbing in front of my computer screen. What a treasure and inspiration your daughter will ALWAYS be. I want magic words to give you, more than ever after my crying fest today because I know it was only the most minor fraction of what you’re dealing with, but there aren’t any. Only that Maddie was magical herself – in her personality, in her love, in her ability to touch others, in the good work that will be done in her name for the March of Dimes for years to come. There are millions of full-grown adults in this world who have never offered such joy and purpose to others as your daughter did in less than 2 years. That’s true magic. When I “met” you, I thought you were funny. The April Fools day pics had me rolling. Oddly, thanks for making me cry today. I will say that they are for Maddie and for Tommy and for your Grandma, but really they are for me. I so don’t want to be in your or her position. Leukemia scares me. And today, I needed to cry. Maybe your sense of humor could come back in other places, anonymous guest posting? Let me know when you feel up to it! oh my goodness she DOES make it cute! I concur! Btw the new site is beautiful. I have thought often of your precious Maddy and as I was showering this morning something came to my mind that I wanted to share with you. Every picture of that little girl shows the love you both poured out on her every minute of every day. If there is any peace that you can find thru all this maybe it can be in the knowing of how much she knew she was loved. She shined just like that special little twinkling star that you will find looking down at you from the heavens.